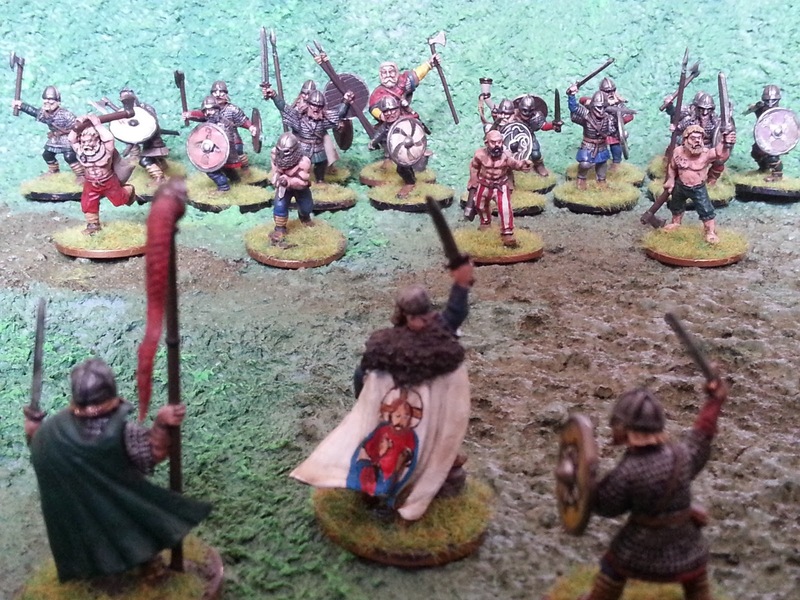 Hooting Into The Abyss: Historical Wargaming for the Fantasy Gamer. Wargaming has a long and illustrious history. From the studies of Prussian Officers to the state rooms of Versaille it can trace its evolution from the period of European empire making where military men, when they weren't killing each other all over the known world, would re-fight famous or hypothetical engagements at their leisure. Fantasy and Sci-fi wargaming is the veritable baby of the wargames family, however, it has become a very vocal and influential baby. Since its emergence from the boom of pen and paper RPG's in the 1970's, fantasy wargaming has swiftly emerged as the most visible of wargame strands, from the high street presence of the big brother of them all, Games Workshop (Stop the family analogies- Ed.) to tie in games of successful movie, TV and computer games franchises such as Judge Dredd, Doctor Who, Starship Troopers, Star Wars and others. 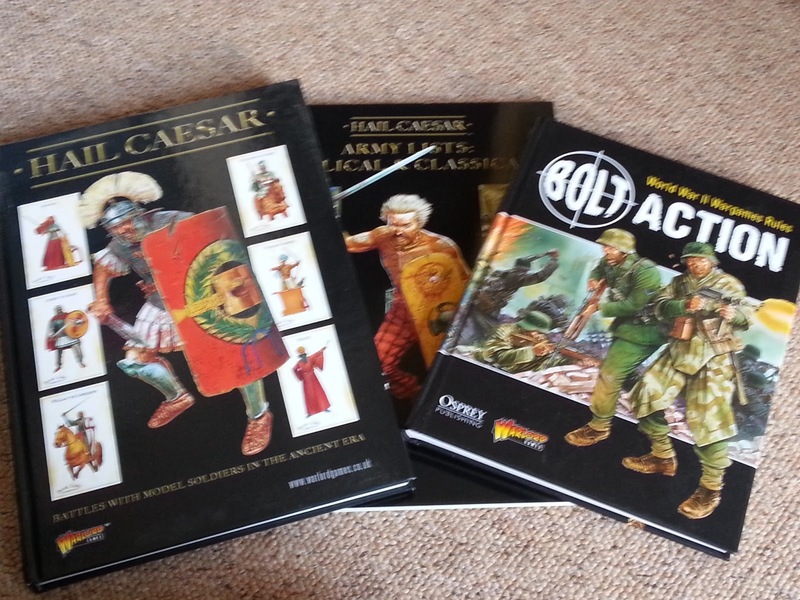 As such it has become the gateway to wargaming for many impressionable young minds over the last 30 years. And I am no different. Featherstone: The start of it all for me. 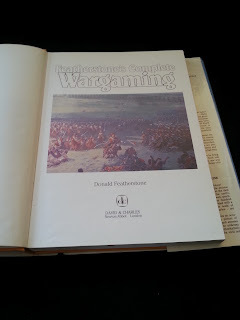 I have long had an interest in military history and indeed my first introduction to the hobby came via a Donald Featherstone book purchased on a trip to Stratford Upon Avon at the age of 9 or 10 and the seed was planted. It seemed confusing though. There were a plethora of options including scale, period, ruleset, and in those pre-internet days I was simply not equipped to make an informed decision. Soon after I read my first White Dwarf. There were worlds of high adventure, of giant robots and knights in shining armour. At the same time I was also reading the Fighting Fantasy books of Steve Jackson and Ian Livingstone, as well as the Lone Wolf books of Joe Dever. The leap was not hard to take. Even at this time GW were excellent at providing that way into the hobby and once their hooks were in me I was theirs for many years. Recently, however, I have started to stray back to my first interest. I was pleased to find, in my early investigations, that historical gaming had moved on a lot since the early days. The games were presented better and seemed easy to get into than before. I am sure many games still have exhaustive charts governing fatigue and indirect fire but they are no longer, at least, printed on photocopies A4 sheets which you obtain by responding to small ads in the rear of military gaming magazines. The breadth of range and scale is still there. There are literally thousands of different systems out there, and I have only scratched the surface with my own investigations. I have no doubt that whatever type of gamer you are you will be able to find something to appeal to you. I shall now briefly discuss a couple games that have caught my eye and that I shall be investigating further. 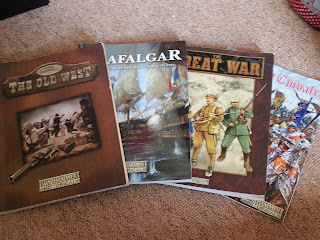 I was sad to see, in 2012, that GW were finally pulling the plug on their unwanted stepchild 'Warhammer Historicals'. I was lucky enough to pick up a few of their games over the years including 'Legends of the Old West', 'Trafalgar' and 'The Great War'. They are solid games that are easy to play for someone familiar with the core GW systems (in those examples the rules are based on the LOTR skirmish game, Man o War and 40k systems respectively) but the gap that this caused in the market, of a good gateway game from the games of the Games Workshop universe, is being filled by various other products. 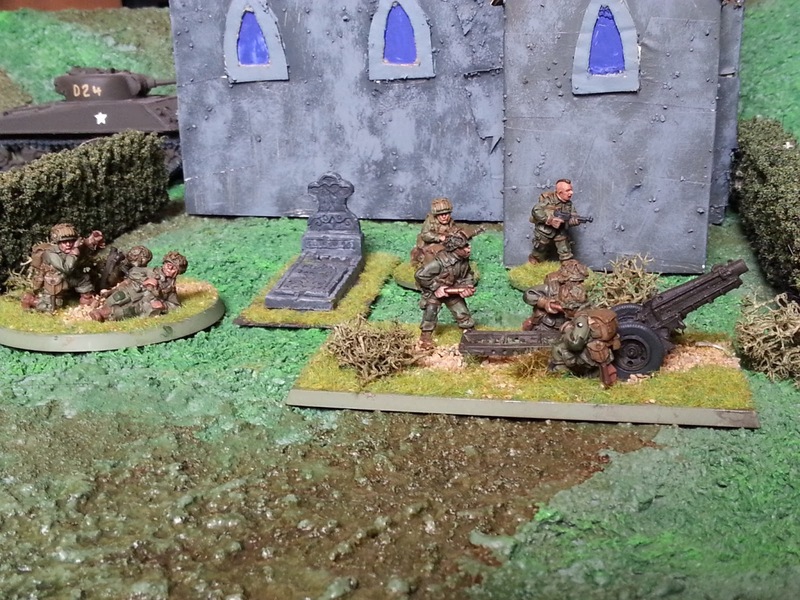 It would be remiss of me not to mention 'Flames of War' by Battlefront miniatures. 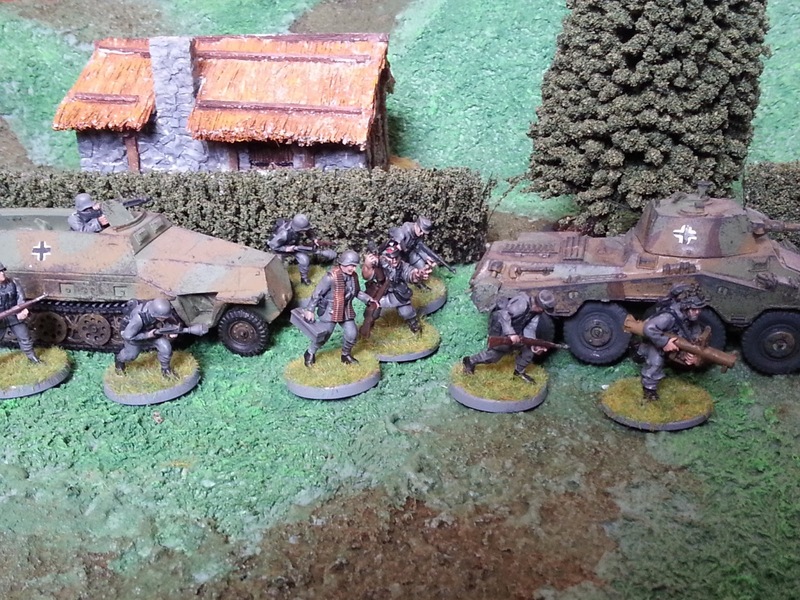 To be honest I have never played this game, I am firmly wedded to 28mm systems, but the rise of FoW has been remarkable. They seem to have successfully captured the same sort of demographic that 40k enjoys, including a burgeoning tournament scene. Backed up by a great range of miniatures and regular supplements FoW demonstrates that a historical game does not need to be niche. Warlord games, another company based in Nottingham and one with several ex-GW employees at their head, have moved from producing a beautiful range of models to also producing beautiful rulebooks. Featuring a core system reminiscent of some elements of classic GW game 'Warmaster' (chiefly its use of leadership and order giving) the three games 'Hail Caesar' (Ancient and Medieval) 'Pike and Shotte' (ECW, Thirty years war etc) and 'Black Powder' (Seven Years War, Napoleonic, ACW and Colonial era) come in full colour well set out rulebooks and are simple enough not to put off newcomers to the hobby, whilst still retaining an impressive amount of tactical depth for wargames veterans. A newcomer to their stable is 'Bolt Action', a second world war platoon level game written by GW legends Rick Priestley and Alessio Cavatore. Familiar in feel to early editions of 40k the game introduces some new innovations including a nifty hidden dice activation method and beefed up suppression rules. Bolt Action has gone down the 40k/WHFB route of introducing separate Codex like supplements and currently have 'Armies of...' books for the Germans, Americans, Russians, Japanese and British and Commonwealth, with more to come. Gripping Beast have long been a go-to company for late antiquity and early medieval models and they have recently released a Dark age ruleset called 'SAGA' along with Studio Tomahawk, a French wargames company who also make the intriguing looking French Indian War set 'Muskets and Tomahawks'. SAGA is a skirmish game revolving around warbands of rampaging Normans, Danes, Saxons and others. It uses an interesting 'battleboard' mechanic that is almost boardgame like in its implementation. Special dice are rolled and then allocated to various spaces on the aforementioned board, allowing unit activation as well as special abilities and attacks. This is obviously not an exhaustive list. There are many many games out there. There are even games readily available from your average large chain bookstore (such as Fields of Glory or the growing range of games published by Osprey.) There are also many suitable miniatures lines, including a growing amount of quality multipart plastic sets for all major wargames periods. What I hope is that some gamers who would otherwise have only stuck within the familiar Warhammer/Warmachine wargame bracket might expand their horizons into history without feeling the need to sew leather patches on their clothes or grow extravagant moustaches. Give these games a go, you might surprise yourself!